Alfred Ernest Cocker was born on 13 May 1883 in Perth, died on 2 Dec 1944 in his home, Ringarooma at age 61, and was buried on 10 Dec 1944 in New River Cemetery, Ringarooma. 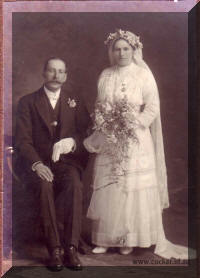 Alfred married Eliza Caroline Barker on 21 Oct 1914 in St Thomas Church, Wellington South, New Zealand. Eliza was born on 7 Sep 1890 in Whitmore, New Zealand, died on 2 Oct 1976 in Son Noels home, 22 Coleman St. Moonah at age 86, where she had been living with him for a number of years. Carrie is buried with her husband. a service at Christ Church, Ringarooma. The Rev. A. France conducted services at the Church and graveside. The late Mr. Cocker who died at his home, after a long illness, resided in the district for the past twenty years. He was a well respected citizen and a ready helper at all times. He was the son of the late Joseph and Emma Cocker and was born at Perth,Tasmania. He leaves a widow and five children, one daughter having predeceased him. Among the many floral tributes were tokens from the Church of England Guild, members or the Country Women's Association, Ringarooma Bush Nursing Centre. The chief mourners were: Mrs. E. Cocker (widow), Elsie (Mrs. Maloney), Thelma and Mabel (daughters), Noel (son) and George (brother). The casket bearers were six members of the Church or England, Messrs H. C .Haines, G. Bird, R. and W. Andrews. J. Wardlaw and A. France. Attendants were Messrs B. W. Robinson and R. Wardlaw. COCKER.-On Decemnber 2, 1944, at his residence, Ringarooma, Alfred Ernest, dearly beloved husband of Eliza Caroline Cocker and loving father of Elsie (Mrs Maloney) Cedric (corporal, AIF), Noel, Jean (deceased), and Mabel, aged 62-years. Interred Ringarooma Cemetery, Sunday Afternoon. 4-Elsie Caroline Cocker was born on 30 Nov 1915 in Wellington, New Zealand, was christened on 30 Nov 1916 in Church of England, and died on 10 Sep 2006 in Royal Hobart Hospital at age 90. Elsie married Cyril Vincent Maloney, son of E. A. Maloney and Unknown. At St. Stephen's Church of England, Richmond, Victoria, on Saturday last the wedding was quietly celebrated of Elsie Caroline, eldest daughter of Mr. and Mrs. E. Cocker, Ringarooma, and Cyril Vincent, fourth son of Mr. and Mrs. E. A. Maloney, of Horsham, Victoria. The bride, who entered the church with Mrs. Hudson, was unattended, and Rev. J. Hudson, vicar of St. Stephen's, officiated. The bride's frock was of white satin, cut on simple lines and buttoned at the back from the neck to the waist. The skirt, which was flared, ended in a slight train and her veil was held in place by a halo of orange blossom, which was used at her mother's wedding. She carried a bouquet of white jonquils and fern tied with white satin ribbon. The bridegroom was supported by Mr. Gilbert. The future home of Mr. and Mrs. Maloney will be at Parkville, Melbourne. They had two children: Alfred Edward (Fred) and Elsie Jean. 5-Alfred Edward (Fred) Maloney was born on 29 May 1943 in Heidelberg, Victoria. Alfred married Elizabeth Watchhorn on 21 Mar 1968. Elizabeth was born on 10 Dec 1946 in Hobart, Tasmania. They had two children: Nicole Rae and Brett. 6-Nicole Rae Maloney was born on 19 Feb 1974 in Hobart, Tasmania. Nicole married Jason Burns on 21 Mar 1998. They had one daughter: Keeley. 7-Keeley Burns was born on 3 Jan 2004. 6-Brett Edward Maloney was born on 29 May 1977 in Hobart, Tasmania. 5-Elsie Jean Maloney was born on 8 Sep 1944 in Heidelberg, Victoria. Elsie married Michael Lawrence Green on 19 Sep 1964 in Moonah. Michael was born on 27 Dec 1939 in Campbell Town, Tasmania. They had four children: Yvonne Elizabeth, Veronica Annette, Michael David Kenneth and Phillippa Rosemary. 6-Yvonne Elizabeth Green was born on 15 Oct 1965. Yvonne married Ray Joseph (Sparrow) McNamara (Part.). Ray was born on 27 Aug 1963. They had two children: Samantha Juanita and Anthony Jamison. 7-Samantha Juanita McNamara was born on 14 Jan 1994 in Launceston. 7-Anthony Jamison McNamara was born on 21 Oct 2005 in Launceston. 6-Veronica Annette Green was born on 23 May 1968 in Queen Victoria Maternity Hospital, Launceston. Veronica married Kerry Brian Wood on 6 May 1989 in Christ Church, Longford, Tasmania. Kerry was born on 20 Apr 1968. They had two children: Lachlan James and Cameron Andrew. 7-Lachlan James Wood was born on 23 Jan 1993. 7-Cameron Andrew Wood was born on 28 Oct 1994. Veronica next married Vincent Zupan. Vincent was born in 1964. They had two children: Jacob and Louisa Jane. 7-Jacob Zupan was born on 5 Aug 2003 in Home. 7-Louisa Jane Zupan was born on 26 Jun 2005 in Home. 6-Michael David Kenneth Green was born on 16 Aug 1969 in Launceston. 6-Phillippa Rosemary Green was born on 10 Jul 1975. Phillippa married Keith Wilson on 30 Oct 2004. They had one daughter: Kayla Lillian. 7-Kayla Lillian Wilson was born on 16 Mar 2007 in Launceston. Elsie next married Ronald Arthur Dennis, son of Arthur Walter Dennis and Florrie Alberta Hallam, on 17 Apr 1950. Ronald was born on 10 Feb 1909 in Queen Alexandra Hospital, Battery Point, Tasmania and died on 3 Aug 1987 at age 78. They had one son: Graeme Ronald. 5-Graeme Ronald Dennis was born on 8 Oct 1956 in Hobart, Tasmania. Graeme married Deb Powell. Deb was born on 5 Oct 1959 in Hobart, Tasmania. They had three children: Claire Elizabeth, Lucy Jayne and Zoe Louise. 6-Claire Elizabeth Dennis was born on 17 May 1986. 6-Lucy Jayne Dennis was born on 13 Nov 1990 and was christened on 2 Feb 1991. 4-Thelma Daphne Cocker was born on 14 Apr 1920 in Scottsdale and died on 27 Jul 1998 in Carr Villa Rose Garden at age 78. Thelma married William Lumley in 1969 in Uniting Church Paterson Street, Launceston, Tasmania. William died in 1976. They had one daughter: Barbara May. 5-Barbara May Lumley was born on 18 Sep 1942. Barbara married Harold Lazarus. They had two children: Andrew William and Karen Louise. 6-Andrew William Stingel was born on 29 May 1968 in Brisbane, Queensland. Andrew married Kerry Ann Kennedy. Kerry was born on 27 Feb 1969. They had three children: Caitlin Maree, Liam David and Ethan James. 7-Caitlin Maree Stingel was born on 24 Oct 1995. 7-Liam David Stingel was born on 18 Nov 1998 in Cairns, Queensland. 7-Ethan James Stingel was born on 2 Jul 2003. 6-Karen Louise Lazerus was born on 18 Oct 1969. Karen married Dean Andrew Causby on 4 Sep 1991 in Burnie, Tasmania, Australia. Dean was born on 4 Apr 1966 in Burnie, Tasmania, Australia. They had two children: Jewel Lee Ann and Dean Andrew. 7-Jewel Lee Ann Causby was born on 17 Oct 1991 in Brisbane, Queensland. 7-Dean Andrew Causby was born on 19 May 1993 in Brisbane, Queensland and died on 26 Jul 2010 at age 17. 7-Peter Stingel was born on 25 Sep 1996. Barbara next married Geoffrey Stingel. They had one daughter: Rebecca. 6-Rebecca Stingel was born on 6 Feb 1976 in Papua New Guinea. Rebecca married Shane Moore on 2 May 2009. Shane was born 19 Mar ?. They had two children: Declan Thomas and Katherine Jane. 7-Declan Thomas Moore was born on 22 Feb 2003. 7-Katherine Jane Moore was born on 14 Sep 2007. 4-Colin Cedric Joseph Cocker was born on 13 Jul 1921 in Scottsdale and died on 31 Jul 1999 in the Launceston General Hospital at age 78. Colin married Linda May Cope, daughter of Harold Cope and Ethel Fitcher, on 1 Oct 1949 in Melbourne, Victoria. Linda was born on 17 Jun 1918 in North Fitzroy, Victoria, died on 15 Nov 2011 in Baptist Care Nursing Home, Compton Downs, Tasmania at age 93, and was buried in Scottsdale Cemetery. They had three children: Colin Desmond, Evan John and Denise Meredith. 5-Colin Desmond Cocker was born on 1 Oct 1950 in Queen Victoria Maternity Hospital, Launceston. Colin married Jeanette Lovell. They had four children: Shelley, Dion, Mathew and Kim. 6-Shelley Cocker. Shelley married Robert Keogh. They had two children: James and Jemma. 5-Evan John Cocker was born on 26 Aug 1952 in Scottsdale. Evan married Elaine Judith Thompson-Tulloch on 25 Mar 1972 in St Mark on the Hill, Church of England, Launceston, Tasmania. 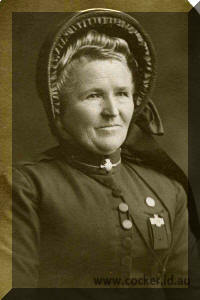 Elaine was born on 23 Jul 1948 in Launceston. They had two children: David Evan John and Heath Irwin Cedric. 6-David Evan John Cocker was born on 24 May 1974 in Queen Victoria Maternity Hospital, Launceston and was christened in 1974 in St Mary Magdalene Anglican Church, George Town, Tasmania. 6-Heath Irwin Cedric Cocker was born on 27 May 1975 in Queen Victoria Maternity Hospital, Launceston and was christened in 1975 in St Paul's Anglican Church, Derby, Tasmania. Heath had a relationship with Private. They had a daughter. 7-Kelly Cocker was born on 25 Sep 1994 in Queen Elizabeth Hospital, Woodville, South Australia. Heath married Denise Frances Fewings, daughter of Kevin Fewings and Sarah Edmundson, on 14 Dec 2007 in their residence, Davoren Park, Adelaide, South Australia. Denise was born in Nepean District Hospital, Penrith, New South Wales. They had two children: Joshua Cedric and Maddison Elaine. 7-Joshua Cedric Fewings-Cocker was born on 6 Jun 2000 in Queen Elizabeth Hospital, Woodville, South Australia. 7-Maddison Elaine Fewings-Cocker was born on 27 Jul 2002 in Lyell McEwin Hospital, Elizabeth Vale, South Australia. 5-Denise Meredith Cocker was born on 17 Sep 1969 in Scottsdale. Denise married Robert Wayne Upton. They had seven children: Belinda, Kiana, Nathan, Damien, Dareen, Ethan and Kieran. 4-Noel Kenneth Cocker was born on 30 Jun 1923 in Scottsdale, died on 7 Oct 1981 in Hobart, Tasmania at age 58, and was buried on 12 Oct 1981 in Ringarooma. 4-Mabel Joyce Cocker was born on 12 Dec 1926, died on 22 May 2004 in Bayswater Victoria at age 77, and was buried on 29 May 2004 in Springvale Cemetery, Victoria. 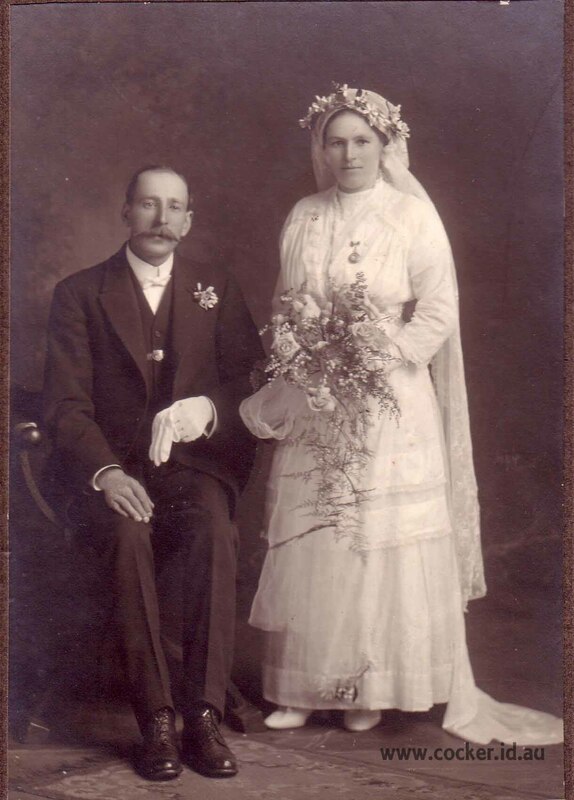 Mabel married Ian Beaton. Ian was born on 23 Sep in Melbourne, Victoria, died on 21 Feb 1971 in Bayswater Victoria, and was buried in Springvale Cemetery, Victoria. They had six children: Andrew, Ashley, David, Loraine, William Lawrence (Billy) and Elizabeth. 5-Ashley Beaton was born on 27 Mar. Ashley married Meredith. They had two children: Heidi and Heather. 5-David Beaton was born on 25 Aug.
5-Loraine Beaton was born on 24 Sep.
5-William Lawrence (Billy) Beaton was born on 25 Dec 1955. 5-Elizabeth Beaton was born on 1 Sep 1963 in Melbourne, Victoria. 4-Jean Lorraine Cocker was born on 3 Apr 1928 in Scottsdale, died on 15 Nov 1942 in the Launceston General Hospital at age 14, and was buried in Ringarooma. COCKER.-On November 15, 1942, at the General Hospital, Launceston Jean Lorraine, dearly loved daughterof Mr. and Mrs. Alfred Ernest Cocker of Ringarooma, and loved sister of Elsie (Mrs. Maloney), Thelma, Mabel Cedric and Noel; in her 15th year. COCKER.-The funeral of the late Jean Lorraine Cocker is appointed t leave Christ Church, Ringarooma, on Tuesday afternoon, November 17, the conclusion of a service, which will commence at 2 o'clock. Interment will take place in the Ringarooma Cemetery. Friends are invited to attend. - ARMITAGE , ARMITAGE, A.F.D.A., 116 St. John street, Launceston.